Thousands of foodies and cultural enthusiasts could line the streets somewhere inside the valley’s borders April 17. 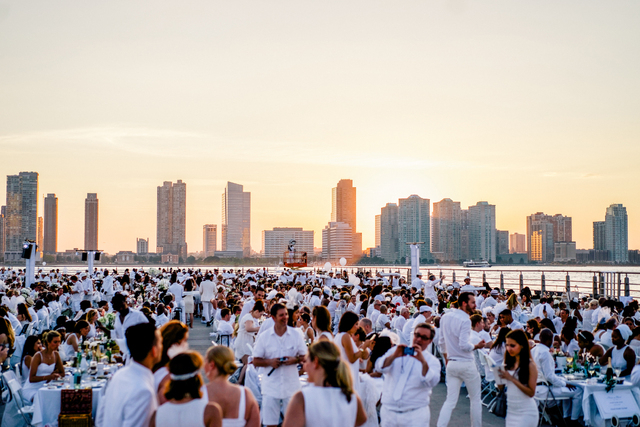 COURTESY Le Diner en Blanc, a large-scale epicurean pop-up event where guests bring their own cuisine, will be coming to Las Vegas on April 17. 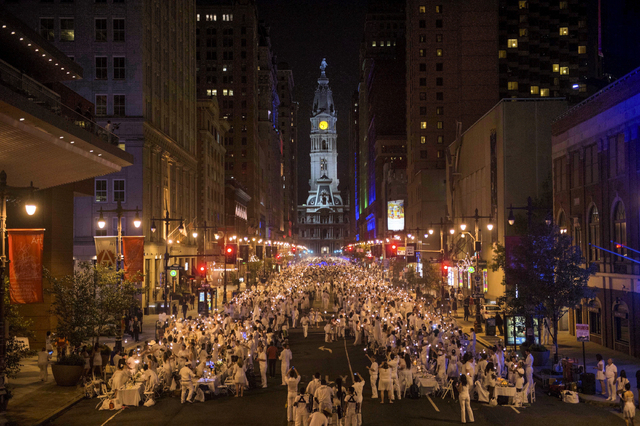 Le Diner en Blanc, a large-scale epicurean pop-up event where guests bring their own cuisine, is coming to Las Vegas — somewhere. 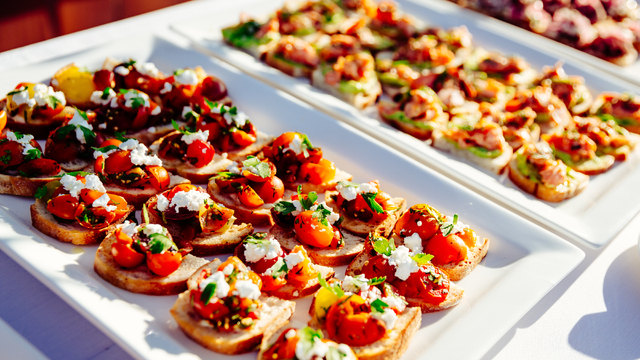 The location of the pop-up dinner event is kept secret until attendees are brought to the site by event volunteers from assigned departure locations throughout the city. 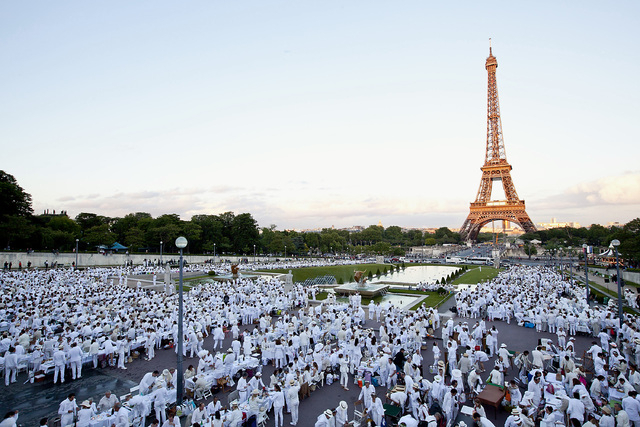 More than 100,000 guests have experienced the Parisian-style picnic in more than 60 cities and over 25 countries. 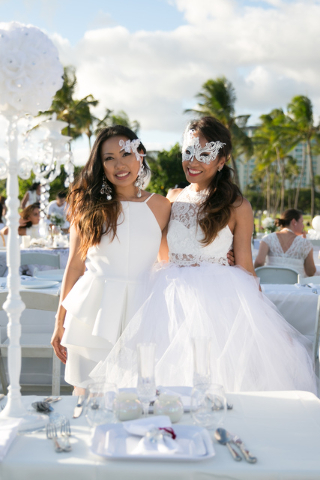 To attend, guests must register for the waiting list by April 10 on Le Diner en Blanc’s Web page at www.lasvegas.dinerenblanc.info/register. Guests will be notified when tickets are available, but there are a few rules that must be followed, one of which is to wear all white. Also, guests must bring a few things, including a white table cloth and tablescape, as desired, and a picnic basket filled with fine food. Attendees must also bring proper stemware, along with white dinnerware. Event coordinators will provide a table and two white chairs for ticketholders. 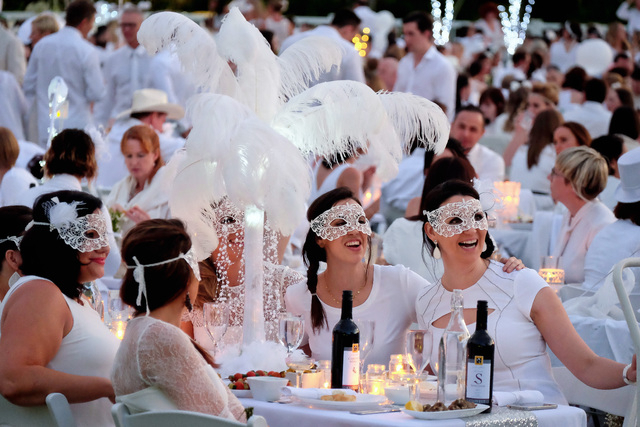 For guests looking for full service, there is an option to preorder a gourmet meal through Le Diner en Blanc’s e-store and then pick it up at the site. Champagne and wine also can be preordered. Guests are not allowed to bring their own alcoholic drinks but can bring nonalcoholic drinks. This is the first time the nearly 30-year-old concept that originated in Paris has come to the city. The event was started by Francois Pasquier who’d invited a group of old friends he wanted to connect with to a picnic at Bois de Boulogne, a public location, with instructions to dress in white so they could recognize each other. His guests also were asked to bring a new friend along with food. That event now brings more than 15,000 friends of friends every year. 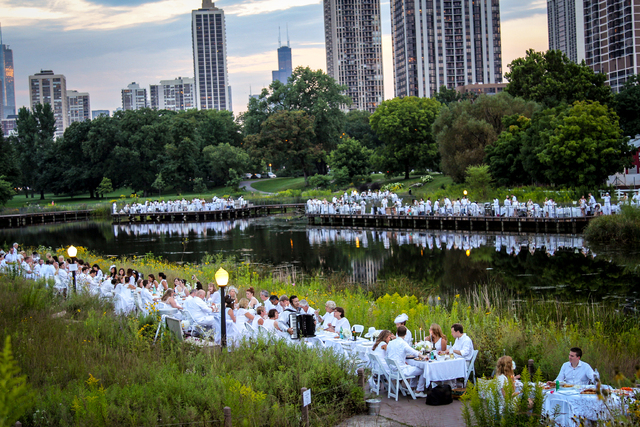 The concept has now spread on a global scale through the founder’s venture, Le Diner en Blanc International in Canada. The brand will assist local organizers bring together their own events. The Las Vegas event will be presented by a Los Angeles-based events production company, iii designs. 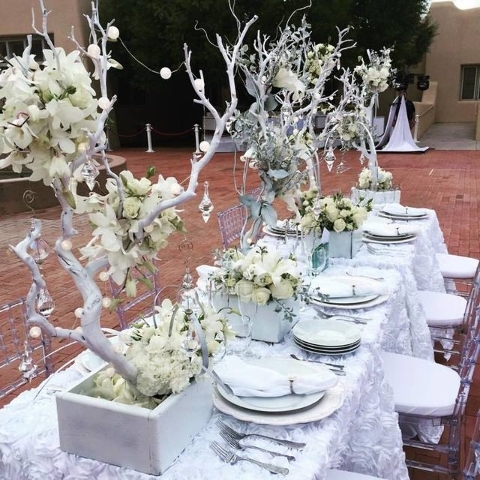 Owners Michail Habicht and Pamela Ferrari have partnered with local event and catering manager Melanie Victoria on the Las Vegas version of Le Diner en Blanc. Rossi Ralenkotter, president and CEO of the Las Vegas Convention and Visitors Authority, will follow the many legends in Las Vegas history who have been inducted into the Nevada Business Hall of Fame on May 24. Ralenkotter will be recognized by UNLV’s Lee Business School and presenting sponsor Deloitte at the MGM Convention Center for his business achievement and community leadership and his overall impact on the economic growth and prosperity of the state, as many other inductees have in the past. Tickets will cost $275. Ralenkotter has brought many successes to LVCVA over the years, including launching a branding campaign that became one of the most successful in the history of tourism and retaining Las Vegas’ role as the top-ranked tradeshow destination and the city’s ranking as one of the leading leisure destinations globally. Ralenkotter began his journey at the LVCVA 40 years ago as a research analyst. He eventually moved up into roles as vice president and senior vice president of marketing before entering into his current position. There have been 14 other inductees since the event’s beginnings in 2002. Ralenkotter will follow such heavyweights as Howard Hughes, William F. Harrah, Hank Greenspun and Bill Boyd. The Regional Transportation Commission of Southern Nevada is opening the mic for Clark County residents looking to help shape the future of transportation throughout the valley. RTC will lend its ear through a five-minute survey at rtcvision.metroquest.com. The survey aims to give the RTC insight on what the resident would like from now until 2040. The survey is available now, and members of the public will be able to access it through June. The survey asks participants to lists important elements the city should deal with, and spend its money on, in the coming years. Some of the choices include light rail, congestion and safety. According to a release by the RTC, the transportation needs of the city outweigh its actual resources, and the survey is a way of pinpointing areas of major public concern. The survey will help shape the RTC’s Regional Transportation Plan, a long-range plan for transportation needs in Las Vegas. The RTC currently supports the efforts of Southern Nevada Strong’s goal of varying the modes of transportation options available in the city. RTC is the administrator of the entity that was formed through a $3.5 million grant from the U.S. Department of Housing and Urban Development. Southern Nevada Strong itself is a collaborative regional planning effort that uses research and community engagement to assess issues facing a region and propose collaborative solutions.